NETWORK FINALS: LAST MAN STANDING and SHARK TANK gained 0.1 in final numbers. CABLE HIGHLIGHTS: Discovery’s GOLD RUSH again topped Friday cable, up 0.05 from last week to 1.01, with lead-out THE WHEEL up 0.06 to 0.40. ESPN’s NBA doubleheader featured San Antonio vs. Clippers at 0.61, and Boston vs. Toronto at 0.51. HBO’s REAL TIME sank 0.09 from last week’s headline-earning episode to 0.47. We had an unusually high-rated show with MAMA JUNE FROM NOT TO HOT at 0.45, way up from its 0.17 (down 0.03) MARRIAGE BOOT CAMP lead-in. Nickelodeon’s afternoon LOUD HOUSE continued to make ratings noise at 0.39. On Lifetime, BRING IT and THE RAP GAME were both at 0.38, both down 0.02 from last week. Bravo’s MARRIED TO MEDICINE slipped 0.03 to 0.37. On HGTV, MY LOTTERY DREAM HOUSE ticked up to 0.33. A&E’s LIVE PD dropped 0.04 to 0.31. Food Network’s DINERS, DRIVE-INS & DIVES lost 0.03 to 0.31. 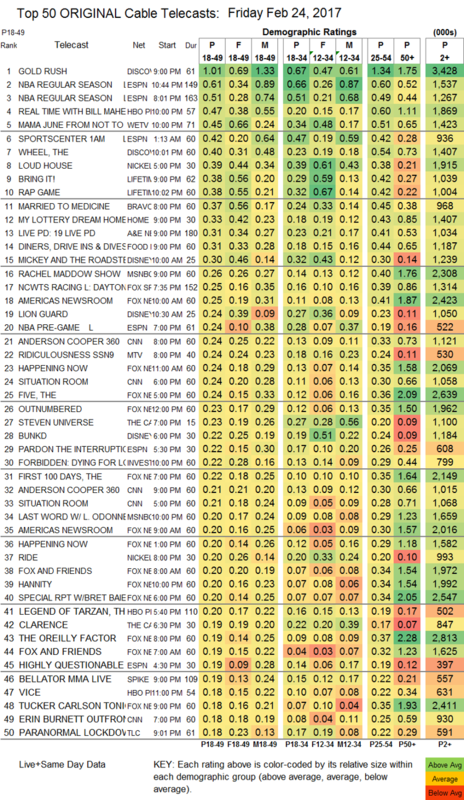 MTV’s RIDICULOUSNESS was at 0.24, compared to last week’s 0.23/0.20. Spike’s BELLATOR LIVE was at 0.19. HBO’s VICE was at 0.18. 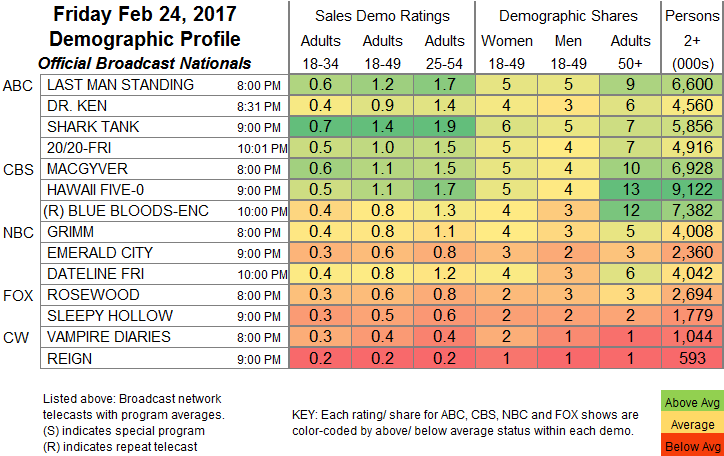 On TLC, PARANORMAL LOCKDOWN held at 0.18, and the UNLOCKED after-show was also steady at 0.15.